In order to provide a suitable root environment for cultivated plants the soil must be constructed in such a way as to allow good gaseous exchange, whilst holding adequate reserves of available water. There should be a high water infiltration rate, free drainage and an interconnected network of spaces allowing roots to find water and nutrients without hindrance. There should be no large cavities that prevent thorough contact between soil and roots and allow roots to dry out in the seedbed. The soil should be managed so that erosion is minimized. Good structural stability should be maintained so that the structure does not deteriorate and limit crop growth. 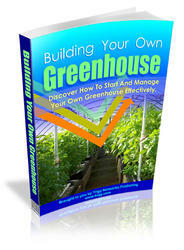 The plant roots and soil organisms live in the pores between the solid components of the growing medium. In the same way that a house is mainly judged by the living accommodation created by the bricks, wood, plaster, cement, etc., so a soil is evaluated by examining the spaces created. Pores greater than about 0.05 mm in diameter, called macropores, can drain easily to allow in air within hours of being saturated (i.e. fully wetted), whereas the smaller pores, micropores continue to contain only water. The roots remove more water from these micropores allowing more air back into the soil (see soil water p338). Ideally, there should be a mixture of pore sizes allowing good water holding, free drainage, gaseous exchange and thorough root exploration, as shown in Figure 17.12. An important indicator of a satisfactory growing medium is its air-filled porosity or air capacity, i.e. the percentage volume filled with air when it has completed draining, having been saturated with water. Soil structure is the arrangement of particles in the soil. The key to managing most growing media is in maintaining a high proportion of air-filled pores without restricting water supply. Figure 17.12 Tilth. The ideal tilth for most seedbeds is made up of soil aggregates between 0.5 and 5 mm diameter. Within these crumbs are predominantly small pores (less than 0.05 mm) that hold water and between the crumbs are large pores (greater than 0.05 mm) that allow easy water movement and contain air when soil is at field capacity (x5 actual size). space and therefore lower bulk density than sands, but for all soils higher values indicate greater packing or compaction. This information is not only useful to diagnose compaction problems, but can also be used to calculate the weight of soil in a given volume. Assuming a cultivated soil to have a bulk density of 1.0 g/ml, the weight of dry soil in one hectare to a plough depth of 15 cm is 1500 tonnes; when compacted the same volume weighs 2400 tonnes. Similarly, 1 m3 ofa typical topsoil with a bulk density of 1.0 will weigh 1 tonne (1000 kg) when dry and up to half as much again when moist. The pore space does not depend solely upon the size of the soil particles as shown in Figure 17.8, because they are normally grouped together. These aggregates, or peds, are groups of particles held together by the adhesive properties of clay and humus. 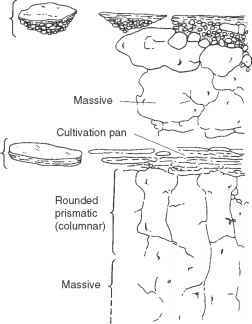 The ideal arrangement of small and large pores for establishing plants is illustrated in Figure 17.12 alongside a dusty tilth with too few large pores and a cloddy tilth that has too many large pores. A soil with a simple structure is one in which there is no observable aggregation. If this is because none of the soil particles are joined together, as in sands or loamy sands with low organic matter levels, it is described as single grain structure. Where all the particles are joined with no natural lines of weakness the structure is said to be massive. 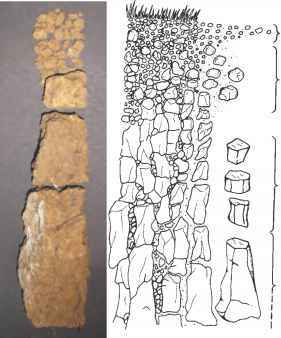 A weakly developed structure is one in which aggregation is indistinct and the soil, when disturbed, breaks into very few whole aggregates, but a lot of unaggregated material. This tends to occur in loamy sands and sandy loams. 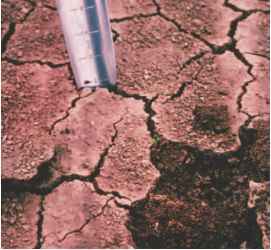 Soils with a high clay content form strongly-developed structures in which there are obvious lines of weakness and, when disturbed, aggregates fall away undamaged. The prismatic, angular blocky, round blocky, crumbs and platy structures which are found in soils are illustrated in Figure 17.13. Figure 17.13 Soil structures. The soil profile on the left is composed of soil particles aggregated into structures that produce good growing conditions. Examples of structures that create a poor rooting environment are shown in the profile on the right. • roots have a major effect on the drying of deeper soil layers, but they also play an important part in soil structure by growing into the cracks and keeping them open. They help establish the natural fracture lines. In strong structures, a close-fitting arrangement of prismatic (see Figure 17.13) or angular blocky aggregates is readily seen. In soils with low clay content the roots are vital in maintaining an open structure. The exploring roots probe the soil, opening up channels where the soil is loose enough and producing sideways pressure as they grow. On death, the root leaves behind channels stabilized by its decomposed tissue for other roots to follow. Fine granular structures are developed under pastures by the action of the fibrous rooting over many years. The soil structure is greatly improved by the rootball. Its physical influence is most easily appreciated by shaking out the soil crumbs from around the root of a tuft of well-established grass and comparing them with the structure of soil taken from a nearby bare patch. Freshly exposed land is often referred to as raw; when weathered it becomes mellow. Once mellow, a seedbed is more easily prepared. The weathering process and influence of cultivation tend to produce rounded blocky structures and rounded granules in the cultivated zone. The structural stability of soil refers to its ability to resist deformation when wet. an obstruction to root and water movement. The surface of soils is also compacted to create surface capping by associated traffic, whether by feet or tyres, if undertaken in the wrong conditions (see soil consistency p342). Natural pans develop in some soils as a result of fine material cementing a layer of soil together. In some sandy soils rich in iron oxide, these oxides cement together a layer of sand where there has been a fluctuating water table, to produce an iron pan. Soil aggregates with little or no stability collapse spontaneously as they soak up water, i.e. they slake. Those high in fine sand or silt are particularly vulnerable to slaking. Aggregates with better stability maintain their shape when wetted for a short time, but gradually pieces fall off if left immersed in water. Aggregates with good structural stability are able to resist damage when wet unless vigorously disturbed. Soils with a high level of clay content have better stability than those with low levels. Stability is also increased by the presence of calcium carbonate (chalk), iron oxides, and, most importantly, humus (see p326). Tilth is the structure of the top 50 mm of the soil. The soil surface or seedbed should be carefully managed to produce the required crumb structure. Sandy soils are easily broken down to the right size with cultivation equipment. Heavier soils are less easy to cultivate and benefit from weathering to produce a frost 'mould'. The fineness of a seedbed should be related to the size of seeds, but ideally consists of granules or crumbs between 0.5 and 5mm in diameter (see Figure 17.12). Cloddy surfaces lead to poor germination, as well as poor results from soil herbicide treatments. The rain on the soil surface breaks down tilth. As soil crumbs break up, the particles fill in the gaps; this reduces infiltration rates. As the surface dries, a cap or pan is formed (Figure 17.14). Thus fine 'dusty' tilths should be avoided and the soil crumbs should be stable so that they can withstand the effect of rain until plants are established. This is particularly important on fine sandy and silty soils, which tend to have poor structural stability. In general, fine tilths should be avoided outdoors until well into spring when conditions are becoming more favourable and growth through any developing cap is rapid. In temperate areas, the conventional preparation of land for planting is a thorough disturbance of the top 20-30 cm of soil. Digging or ploughing buries residues of previous plantings and weeds, and with repeated passes of rakes or harrows a suitable tilth is created (see p313). This procedure is very demanding on energy, labour and time. Many of the cultivations tend to interfere with the natural structure-forming agents and when undertaken at the wrong time they create pans or leave a bare, loose soil vulnerable to erosion (see soil structure p311). Some of the compaction problems are overcome by cultivating in beds which confines traffic to well-defined paths between the growing areas. 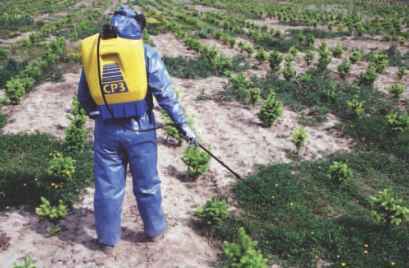 The advent of effective herbicides has, in certain cases, enabled the inversion of soil to be eliminated. The use of powered implements has speeded up work and reduced the number of tillage passes. In some areas of horticulture the adoption of minimum or zero tillage has preserved natural structure while beneficially concentrating organic matter levels in the surface layers and reducing wind and water erosion. Ploughing and digging are used to loosen and invert the soil. The land is broken up into clods and an increased area is exposed to weathering. As the soil is inverted, weeds, plant residues and bulky manures are incorporated. The depth of ploughing or digging should be related to the depth of topsoil, because bringing up the subsoil reduces fertility in the vital top layers, seriously affecting germination of seeds and establishment of plants. If deeper layers are to be loosened a subsoiler should be used. In plastic soil conditions the plough can smear the soils, more so if the wheels of the tractor spin in the furrow bottom. These plough pans tend to develop with successive ploughing to the same depth. Ploughing at different depths or attaching a subsoil tine can reduce their incidence. Digging with a spade does not produce a cultivation pan and is still used on small areas. Spading machines or rotary diggers imitate the digging action without the disadvantages of ploughing, but tend to be very slow. Rotary cultivators are used to create a tilth on uncultivated or on roughly prepared ground. The type of tilth produced depends on suitable adjustment of forward speed, rotor speed, blade design and layout, shield angle and depth of working. The 'hoe' blade is normally used for seedbed production, but does have the disadvantage of smearing plastic soils at the cultivation depth, producing a rotovation pan . ' Pick ' tines produce a rougher tilth, but less readily cause a pan. Subsoil tines can be fitted to prevent these pans developing. 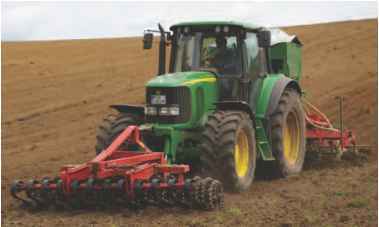 seedbed has been reduced by the use of rotavators and other equipment that completes several of the stages in one pass (see Figure 17.15). Progressive' type cultivators were introduced essentially to loosen coarse structured clays by drawing through the soil banks of tines, increasing in depth from the front, to cultivate the soil from the top down in one pass. Although this requires powerful tractors to pull, especially if subsoiling tines are attached, it is a time-saving Figure 17.15 Seedbed preparation. Several stages of the process are completed in a operation and the recompaction single pass inherent in multiple pass methods is reduced. These cultivators should not be used on well-structured soils where full depth loosening is unnecessary. Under-loosening' cultivators have been designed to loosen compact topsoils without disturbing the surface, which ensures a level, clod-free and organic-matter-rich tilth. Used under the right conditions these implements improve water movement and plant growth. However, loosened soils are more susceptible to compaction and consequently the equipment should only be used when compaction is known to be present. Figure 17.16 Subsoiling. The subsoiler is drawn through the soil to burst open compacted zones. It leaves cracks which remain open to improve aeration, drainage, and root penetration. The cracks created should link up with artificial drainage systems unless the lower layers are naturally free draining dry enough to be able to withstand the heavy tractor that is needed (see loadbearing). Effective subsoiling is made easier if the top surface is loosened by prior cultivation. Although the draught is higher, subsoil disturbance is increased substantially by attaching inclined blades or wings. Successful subsoiling is accompanied by a lift in the soil surface (soil heave) which usually makes it unsuitable for improving conditions in playing fields. Subsoiling should only be used when the cause of any waterlogging is related to a soil structure fault (see also drainage). Slow subsoil permeability caused by high clay content is usually rectified with mole drainage (see p345). If the soil is too sandy or stony, a subsoiler can be used so long as the cracks created lead the water into a natural or artificial drainage system. Subsoilers used in the right conditions readily burst massive structures and soil pans created by machinery, but some natural pans are too strong for normal equipment. The problem of cultivation pans can be dealt with by using conventional subsoilers or by attaching small subsoil tines to the cultivation equipment. This tends to increase the power requirement but eliminates the pan as it is created. How poor soil structure can effect root depth? How can 'cultivation pan'/soil compaction/horticulture be rectified? What makes channels in the soil profile? What are the arrangement of soil? What is a soil structure pans? Why should the crumbs be broken in soil? What are crumbs in soil structure? Why platy soil found in cultivated lands? Is platy structure ideal for topsoil? Why crumb soil structure most suitable plant growth and production? Why is a crumb soil structure most suitabl for maximum plant growth and production? Why is soil crumb structure most suitable for crop production? How does the effect of platy structure soil have on plant root pentration? Which soil is the most suitable for crop production between crumb and prismatic? Why crumb structure good plant growth? How soil structure in fulence water movemrnt? Which soil structure has caps on the surface and pans in the soil?